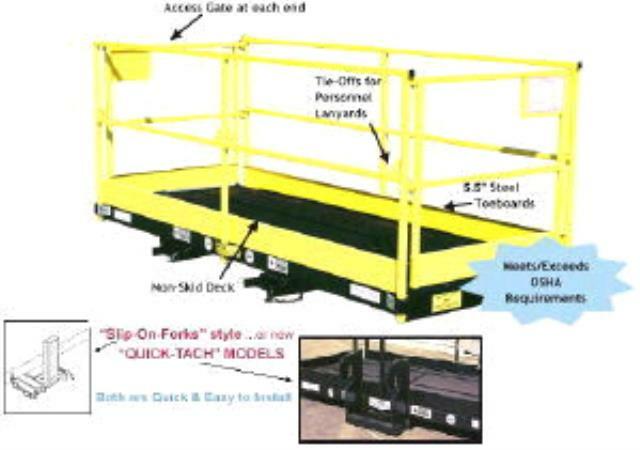 This 4' x 8' Lift Platform for fork lifts will go where scissor-lifts can't, faster than putting up scaffold, provides a wider platform than boom lifts, and can reach over obstructions. Spring hinges and spring loaded latches provide self-closing and latching gate action, for increased safety. Full Perimeter Guard Rail System constructed of 1 " square steel tubing & consisting of a 42" high top rail, a mid rail, and 5 " high intregal toeboards. * Please call us for any questions on our lift platform 4 ft x 8 ft rentals in Durango CO, LaPlata County, Mancos, Ignacio, Cortez, Bayfield, Pagosa Springs, and Silverton CO.